I've been playing with the new Christopher Ward C9 Jumping Hour watch. Jumping hour or jump hour watches have a long tradition; it's at least a century old, Cartier made some notable examples in the 1930s and now direct sales organisation Christopher Ward has added a model to its portfolio. The idea is simple enough; instead of the traditional two-handed clock face you get a traditional minute hand but the hour indicator is static, in some sort of window (see the picture). Every time the hour changes it "jumps" one forward. The complexity is in getting the movement to stay steady in spite of the energy required for this sort of push forward. The design is therefore unorthodox and that's my first problem with this watch. Call me old fashioned but I like to be able to tell the time at a glance. Look at the one in the picture and your first reaction, if you're like me, is that the time on it is ten to 12 - but it's not, it's 12.50 because everything is past the hour that's on display. In fact when I woke up the other morning and glanced at it - now remember, it's first thing in the morning, I've just been away and I'm a bit groggy - there's an IX in the window but that doesn't matter, I can just see the hour bit pointing straight up and assume I've slept through the morning and it's something past 12. It was actually 9.15. I just think the ability to tell the time really quickly is a good thing in a watch. It's kind of why I have one. You do get used to it, though. On day two I was enjoying working the time out a bit more and on day three it had started to become instinctive, although anyone else looking at the watch to ask the time would have found it a bit of a struggle. My wife and daughter both found the design a bit pointless, to be honest. I've grown fond of it. Maybe it's a bloke/gadget thing. It's well designed, although the brand badge on the face looks a little tacked on. I'm a sucker for automatics and the customary viewing window on the back to see the Swiss movement, adapted from an ETA 2824, is the usual treat. It's this movement that explains the price. Keeping it steady with the surge in energy required to make the hour jump isn't easy. That's why this is Christopher Ward's most expensive watch to date at £1150. It's well made and attractive and if you want something a little different then the jumping hour combined with the reliable timekeeping is certainly something to consider. But at that price - and I do accept it's one of the lower-priced Swiss-made jumping hour models around - it's an expensive gloat. At that price point you can start to consider a Tag Heuer from Goldsmiths Jewellers, for example, or for £60 more a Longines; an extra £350 - not a trivial amount I agree - and you're looking at an Omega. These will be more basic watches of course. They won't be jumping hour models or anything like it. 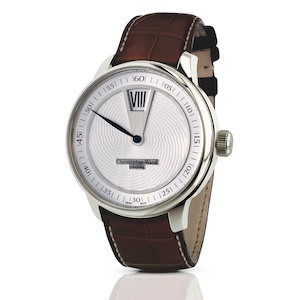 But moving over the £1000 mark means Christopher Ward is starting to edge into the prestige brands' territory. Given the company's overt rejection of celebrity endorsements, heavy marketing budgets and the traditional retail route in general, I do wonder whether it's going to be able to compete there no matter how swish a watch looks or how technically elegant its innards may be.